Oh my. 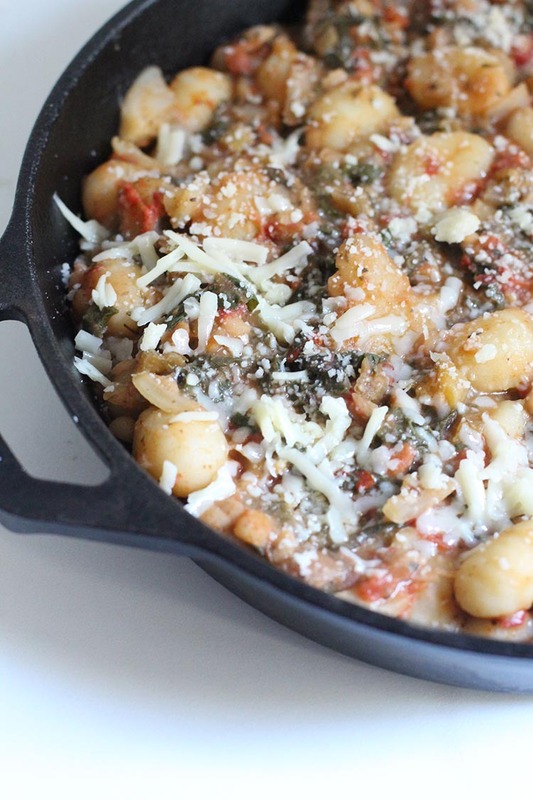 Meet my new favorite 15-minute dinner: Gnocchi and Swiss Chard. 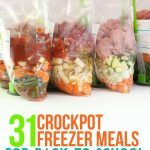 Simply combine all of the ingredients in a freezer bag and freeze for a busy weeknight. The idea for this recipe came from a Facebook poll about your favorite vegetarian meals. I was looking for inspiration for my upcoming meat-free slow cooker freezer meals cookbook and the combination of gnocchi and swiss chard was recommended by a couple of people. While I didn’t think it would make a perfect slow cooker dish, I fell in love with the idea of making it in the skillet. I shared a freezer-to-skillet chicken fajita recipe a few weeks ago and I think I need to come up with more simple freezer meals that don’t require the crockpot. 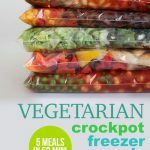 Coming home to a finished dinner in the crockpot is great, but so are recipes that can be prepped ahead of time and cooked in 15 minutes or less. It’s a simple meat-free meal that vegetarians and meat eaters will both love. It’s super healthy and delicious. It can be prepped and frozen ahead of time. A win-win-win. I made this meal for dinner last week and my husband and I were both in the clean plate club. 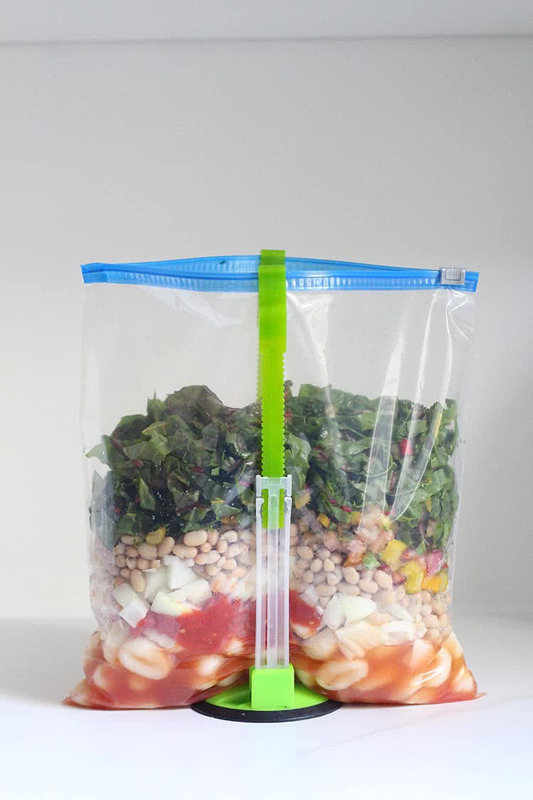 Add all ingredients to a gallon-sized plastic freezer bag and freeze for up to three months. When ready to eat, thaw overnight in refrigerator. At dinnertime, coat a large pan with 1-2 tablespoons of olive oil. Add contents of freezer bag and sauté over medium-high heat for 10 minutes or until heated through. Top with shredded mozzarella and parmesan cheeses and serve with crusty Italian bread. YUM. what is a good brand of gnocchi to buy? I bought the stuff in the pasta aisle. It was the store brand. 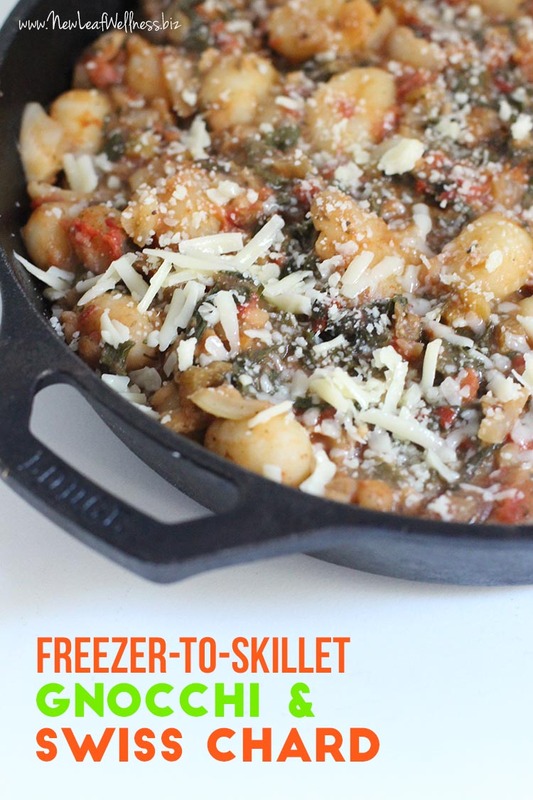 I was so excited to try this, but when I went to pour the contents of the bag into my pan the gnocchi had absorbed all of the tomato liquid and I had huge clumps that looked like raw dough. There wasn’t one whole gnocchi in the bag. How did you prevent this from happening to yours? Hmmm, I’m not sure. I prepared it just like in the pic and it turned out great. If I were you, I’d try putting the gnocchi at the top of the bag next time. That way it won’t end up touching the tomatoes. Couldn’t find the swiss chard at this time although I have seen it in the stores. Anyway, I bought a bag of baby spinach/baby kale which is chopped. About how much should I put in to substitute for one bunch of swiss chard? Thank you so much. If the bag is 5oz I would use the whole thing. If I was going to use Dried navy beans and soak them, would I need to cook them ahead of time? I think so. Unless you think they’ll cook in the 10 minutes needed to cook the dish. Toni, thanks for the tip! We’re always looking for great products to try. And crystallized ginger in stock…yum! Liz, I’m so glad that we are able to help out with your family meals and your recover. Good luck with your next surgery.